Populonia is an ancient Etruscan settlement, which is located near the western Italian coast. Populonia Piombino is located in the coast region in the Tuscan province of Livorno. In this central part of Italy, Populonia was once one of the major ports, as there was organized the largest center for the processing of iron in the Mediterranean. The ore is brought from the nearby island of Elba. Etruscans used to call the city or Pupluna, Fufluna, by the name of the god of wine Fufluns. Situated on Monte Massoncello Peninsula, Populonia was the only Etruscan town that has an outlet directly to the sea. The main reason for the emergence of the ancient village is precisely the rich deposits of silver and iron ore located on the island of Elba. In 282 BC in Populonia consists a battle between Etruscan and Roman Republic, which ended with victory for the Romans. Following the Roman invasion the town was significantly destroyed, and about 1 century BC here plays out civil war between Marius and Sulla, which permanently destroys Etruscan city. When the old part of Populonia, tops Molino and Del Castello, for some time there is a self-governing village. 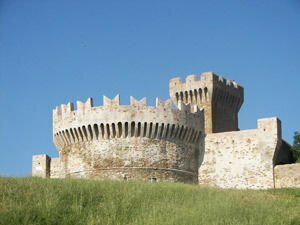 Populonia was destroyed and there is no such Etruscan city in 570 in the invasion of the Lombards. A small proportion of the population fled the island of Elba. In the Middle Ages, Populonia becomes a fief of Luca during the Lombards. At the end of the eighth century Charlemagne decided to give Populonia as a gift to Pope Adrian I. Today what is left of Populonia are the ruins of the fortress town, built during the Middle Ages. The walls were built for protection from pirates. Additional fortifications and citadel were built in the first half of 15 century by Appiani II and restored in 1800 as a symbol of home. The ppiani dragon today can be seen above the entrance to the medieval village in Populonia. Today Populonia is part of an important and valuable archaeological park. Etruscan settlement is a unique combination of ancient cobbled streets, and small shops that attract tourists with various souvenirs. There is also built a private museum where you can consider exposure to the Etruscan and Roman remains discovered in the region. From the top of the castle is a magnificent view of the Tuscan Archipelago. Populonia is surrounded on 3 sides by azure waves. The settlement is related to the Gulf of Baratti, where they found important Etruscan roads and artifacts. The archaeological park, which covers about 80 hectares, can be visited for the wild history and archeology of the place. From the height of the hill village of Etruscan Populonia is a beautiful view down to the very island of Elba. The entrance ticket to enter Populonia is about 2 euro, children enter free. In many tourist shops here, you can choose a gift from costumes and clothes, jewelry , home items, gold and other jewelry of silver.